First ever month above 10% share for the Chevrolet Onix. The Brazilian new light vehicle market celebrates 19 consecutive months of year-on-year gains in November at +12.2% to 221.317 units, leading to a year-to-date tally up 14.1% to 2.245.677 registrations. Chevrolet (+21%) remains by far the most popular carmaker in the country, lifting its share to 20.5%. 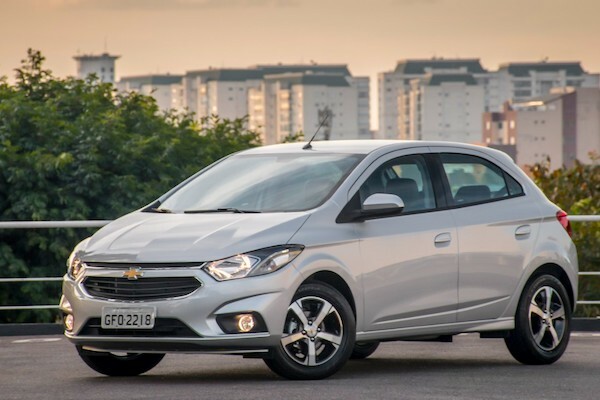 This is Chevrolet’s first time above the symbolic 20% share mark in Brazil in almost 7 years: since January 2012 (20.9%). Volkswagen (+30%) grows faster but is over five percentage points below at 15%, distancing Fiat (+8%) at 12.1% and trailing the market. Renault (+54%) posts the largest gain in the Top 10, eclipsing Ford (-8%) to step up to #4. All remaining brands in the Top 10 trail the market with Jeep (+11%) and Toyota (+7%) faring the best but Nissan (-9%), Honda (-1%) and Hyundai (-3%) in decline. Chery (+276%) is once again the best performer below, stuck at an excellent 15th place, with Mercedes (+21%) and Kia (+19%) also standing out. Over in the models ranking, the Chevrolet Onix (+20%) goes from strength to strength, celebrating 40 consecutive months at #1 (no interruption since August 2015) but also posting its first ever month above 10% share at 10.1% (previous record 9.7% in January 2017), its 2nd highest volume ever at 22.277, only 47 units below its 22.324 record established just last month and its most dominant win ever at 2.52x the sales of the #2 ranked car, smashing its previous record of 2.13 established last month… The VW Gol (+40%) soars to #2, its highest ranking in 4 years – since it topped the charts outright in December 2014. As a result both the Ford Ka (-3%) and Hyundai HB20 (-2%) drop one spot while the Chevrolet Prisma (+26%) rounds up the Top 5 like last month and YTD. The Renault Kwid (+218%) storms back inside the Top 10 at #6, with other great performers including the Chevrolet Spin (+69%), VW Polo (+47%), Renault Sandero (+35%), Ford Ka Sedan (+33%) and Hyundai Creta (+24%) up to a new record #9. The VW Virtus is up 3 spots on October to #17, the best-selling recent launch (<12 months) above the Toyota Yaris Sedan (#25) and Yaris Hatch (#31) reversing roles. Finally, note the Citroen C4 Cactus landing inside the Top 50 for its 2nd month in market. Full November 2018 Top 25 brands and Top 150 models below.